The safest, easiest & most dependable method for ethylene application is available for lease or purchase. 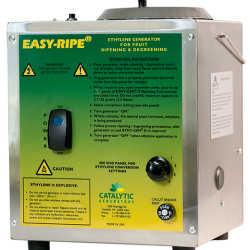 Our Easy-Ripe® Generator provides consistent, non-pressurized ethylene on a continual basis in order to achieve uniform ripening and degreening….the “trickle” method! Ethylene production begins in just a few minutes! Ethylene output is adjustable for multiple room sizes, which means the Easy-Ripe® can adapt to any ethylene PPM requirements. For larger rooms, additional units easily achieve proper ethylene levels. A red light will provide an alert in the rare occurrence of a malfunction. Available with TÜV (TÜV SÜD) and CE Conformity to 73/23/CEE and 89/336/EEC. Available in a wall-mounted version. We have found these setting to be applicable for most rooms and provide sufficient ethylene (100-200 ppm) to initiate the ripening process in bananas, tomatoes and other fruits (except citrus, which requires less than 10 ppm; for this, use our Citrus Generator). However, some ripeners prefer to take ethylene readings with an Air Sampling Kit and select the setting that produces the ethylene level desired. As always, please contact us if we can be of service. Note that for rooms larger than 340 m3, additional generators can be used, if needed, to achieve the proper ethylene level. It may be possible to use just one generator for a room that is larger than 340 m3; it depends upon how tight the room is. We have some customers that are able to use just one generator in rooms that are over 500 m3 and achieve 150 ppm of ethylene. *Remember that ethylene is explosive at 27,000 ppm; always use our generators in ripening rooms that are 45 m3 or larger. Our products, when used as directed, cannot produce explosive levels of ethylene in commercial ripening rooms.